Presumably everybody has a story about the eventual race's winner. And if My Name is; Err, Uhm One Lap Down's "Jeffie" can wax-on 'bout this year's Barber's race being akin to my Hometown's Seafair and its Unlimited Hydroplanes. Then I can Bloody well tells Yuhs my Will Power story, Righto? First off, and surely you'll just think I'm sayin' I-T now, but. On Friday during this year's Carb Day I pronounced to Dave, my personal IMS Sherpa that Will Power would win, along with previously having scribbled how Danica would hit the Wall. Thus I just sat Thar Bemusedly letting Dave tell me All of his Will Power wisecracks, like him calling him Whiney Will! And a bunch 'O others I'll refrain from, for which I just laughed off. It was Wayback following my Debutante Indy 500 in 2009, when the "Racing Gods" struck me, again. As former Indianapolis Bureau Chief Daniel Baines Cooper had taken me to what then was the Hall of Fame museum inside Mother Speedway (IMS( the day after the race. And having just learned of the Blue Crown Spark Plugs Racing Team earlier that year, naturally I had to ask the IMS Museum's Docent at the entryway if they had Mauri Rose’s 1947-48 INDY 500 winning Blue Crown chassis on display? Thus as I stood admiring Parnelli Jones 1963 Indy 500 winner 'Ol Calhoun', Danny returned, looked behind me, did a double take and then asked; Do you want to meet Will Power? Uh Duh! Hence amazingly, in a virtually empty IMS Museum, there were a group of three persons standing directly behind us. And as I turned around Danny introduced me to Will and before I knew it I was shaking hands; CRIKEYS! Then I sheepishly asked him how far he’d gotten up to? (During the 500) Saying I think I heard third over the PA system, to which Power replied; I’ got up to second and was chasing down Helio. Then I mentioned to him how I’d heard something about his insane training regimen? You’re doing a Triathlon shortly aren’t you? NO! All of that was my Trainer’s idea, but I did do the Mini 500 this month. As recall this is the year Power had been Drafted into Team Penske as Helio Castroneves potential replacement, as HULIO' was on trial for Tax Evasion! And Will was driving a yellow & blue Penske Truck Rentals liveried car, as ultimately the third Shoe' at Penske that season. 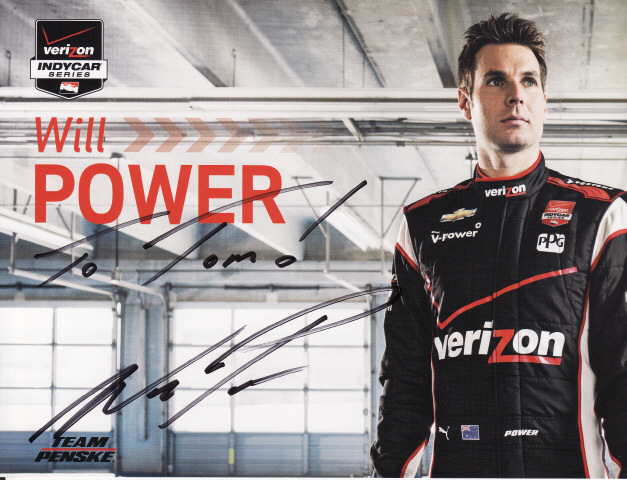 And simple as that, I instantly became a Fan of Will Power's, even going so far as having Dave help me procure a Will Power T-Shirt between 2011-12 at the Brickyard, now somewheres' buried in Tomaso Manor. Not to mention the torment of Power causing me to G-O Berserk Yearly upon his eventual Title Meltdown's, usually to that Dastardly Dario "REO Speedwagon" Franchitti. Otay, so I cannot say I was looking forward to the Day's outing in the Blazing Heat. Although having been to another Scorcher Wayback in 2013, somehow this year's race-day felt Hotter; ZOINKS! As I knew it was gonna be a H-O-T one, when sometime between 5:30-6AM, when trying to apply a layer of Suntan lotion, I began pourin' buckets 'O sweat whilst trying to apply a liberal coating for the Day's outing; SHEISA! Musing to Thyself I Don't think you're supposed to apply it to wet skin, Eh? Not to mention CARPETS' packing 'N schlepping multiple waters and an always tasty lunch for Us! Think we left sometime before 7AM and were parked around 8AM? About a half mile's Trek away from the track, and after putting a second coat of Shellac; Err Suntan lotion on a now relatively "Dry" body due to our windows rolled-down AC, and with my world renown famous "Floppy Hat" secured upon thou Noggin', we set off towards Mother Speedway. a-half hours remaining until going Green! As Dave playfully asked me if I wanted to go to our seats? HELL NO! And Bake upon those world famous Shiny Hard-pan silver aluminum bleachers, in the Sun! Around 10AM we meandered over to the IMS Museum to meet some friends, as it was just plain H-O-T in the Sun without a Cloud in the Sky, before we departed back to our shady respite beneath our seats in the Short Chute between Turns 1-2, now our favourite vantage point for the race. As finally Dave decided it was time for us to amble up to our seats, for which I was overly surprised how the grandstands were nearly full as we situated ourselves topside around 11AM-ish, as I only recall Dave telling me one hour to G-O! As funniest part for Mwah, was that the man, who Dave thought was a local, had purchased two seats, with one being for his Cooler, I kid Yuhs Not! And for most of the race, all I could hear was the constant roar of the racecars, and the only time I could totally understand what "The voice," nee Dave Calabro or bob Jenkins were saying over the Public Address was when the track went eerily "Quiet" during one of the multiple Yellow Flag periods. As I heard Calabro say "It's A New Track Record!" Uhm, Heat Record at 1:45PM Eastern, but He never said what that was, or how Hot it was, before the roar of engines under the Green Flag Drowned him Out again. And I have to say I was Happy with the Fans Applause for HULIO', whom I've never been a H-U-G-E Fan of, in case Y'all cannot tell. but I was happy hearing him during Monday Night's Victory Banquet broadcast on local TV that he'd be back for another try, since He said I cannot go out that way. And then I roared in Glee over the man Jeff Iannucci of One Lap Down named DJ WillyP' a long time ago, when Will Power triumphantly swept to a well deserved maiden Indy 500 victory! Yelling vociferously, and Hooting 'N Hollerin' next to Dave that Will Power had Won! As I especially enjoyed Power's Victory Parade Lap afterwards, and chuckled inwardly to myself when I asked Dave if he could take a picture of Power, to which he responded, He's too Far Away. Which to Mwah, perfectly Sums up Power's In-car Radio retort upon taking the Checkered Flag. "Show Me some Respect Mother Fuckers!" Uhm, was it Scott Dixon?